This is an exhibition showing the work from “Applied Media Aesthetics” of the MSc in Multimedia and Entertainment Technology and BA (Hons) in Digital Media programs. “Applied Media Aesthetics” is a class for exploring formal aesthetic elements and their usage in expressing ideas. It is designed to help students develop their own creative signatures using these attributes as syntax to say engagingly what is on their minds via the visual form. This show: “Two Portraitures” is a selection of students’ works from an assignment given for observation, conceptualization and expression. 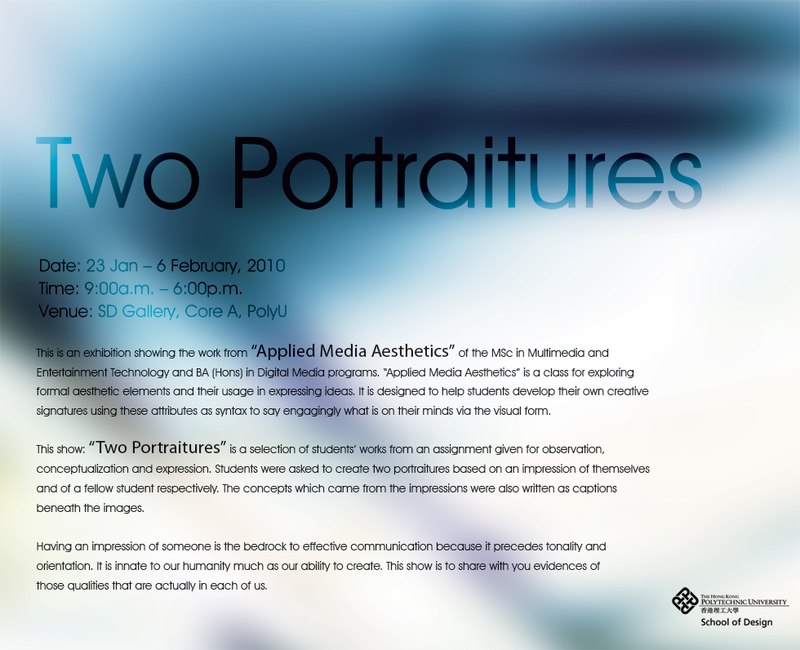 Students were asked to create two portraitures based on an impression of themselves and of a fellow student respectively. The concepts which came from the impressions were also written as captions beneath the images. Having an impression of someone is the bedrock to effective communication because it precedes tonality and orientation. It is innate to our humanity much as our ability to create. This show is to share with you evidences of those qualities that are actually in each of us.